Our homeopathic remedy finder a.k.a SRF (Smart Remedy Finder) can replace a homeopath for common ailments. Unless you are a homeopath, finding the right single remedy is not easy. You need really good skills or a homeopath to do that. There are times when a homeopath is not available e.g. the middle of the night, weekend, vacation etc. Wouldn’t it be great to have access to a homeopath 24 hrs a day, 365 days a year, without ever leaving your house and all you ever needed was an internet connection. Well that access to a homeopath, 24 hrs a day can now be had if you have an internet connection. 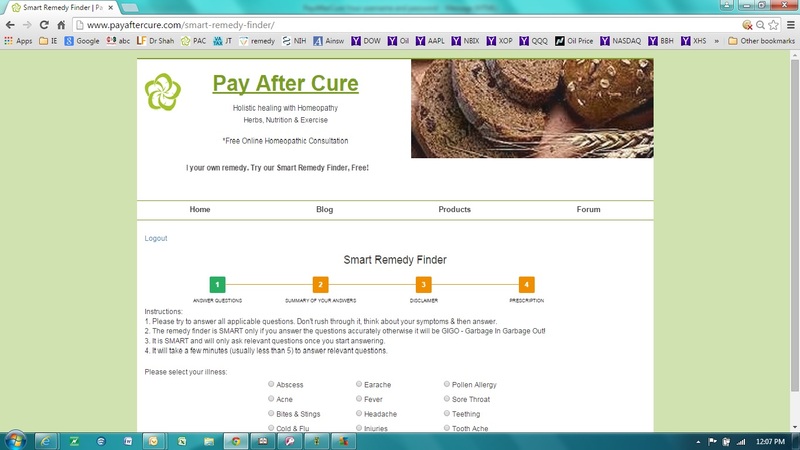 We present our Smart Remedy Finder, probably the most advanced remedy finder available on the web & its FREE! Out of hundreds of possible remedies, the SRF reliably & accurately narrows the remedies fitting your ailment to only 5 remedies. This narrowing is the toughest part where only seasoned homeopaths succeed. If you want to have a deeper understanding of homeopathic art of healing, then read these Prescribe and Incompetence articles also. With our SRF and these 3 articles above, we have brought the skills of the expert homeopaths to the general public. If you are more inquisitive and willing to embark on the journey to become a good prescriber, then to master it, you have start a lifelong journey of reading & understanding the human body. How To Use The Repertory, with A Practical Analysis of Forty Homeopathic Remedies, Glen Irving Bidwell, M.D. If you want to benefit from the holistic healing approach with homeopathy, you can Contact Us for any further details or help or you can use our FREE Smart Remedy Finder to find the right remedy within minutes for many ailments & injuries along with detailed prescription guidelines on how soon to expect improvement, when to repeat the dose etc. SRF is FREE to try, you have to use it to believe all that we are saying. In most cases, the correct remedy can be found in 3-5 minutes. The SRF gets you to the right remedy within minutes, anytime of the day, without the need of a homeopath.